The following update was sent to MACUCC churches on Nov. 14 by the Conference Disaster Resource Team. As the stories, images and needs continue to emerge from New York and New Jersey, our hearts go out to all the folks trying to manage through the crisis as they head for the long road to recovery. Requests for help and funds also continue to emerge and we want to respond. Below is a list of websites with information about ways you can help with the recovery efforts. If you have contacts that you know in the affected region who are looking for assistance or resources, let us know and we can post them for everyone in the weeks ahead. We have challenged our MACUCC churches to provide 1,000 clean-up buckets to Church World Service for their disaster recovery in the mid-Atlantic and beyond. CWS will be collecting buckets the first week of December. 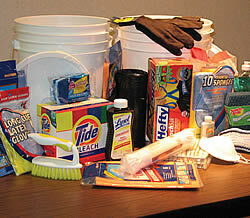 Monday, Dec. 3, is the last day to drop off clean-up buckets. The Church World Service truck will collect them for delivery on Dec. 4. If you have assembled a bucket and wish to have a receipt mailed to you for tax purposes, you may call the Church World Service's office at 413-583-8355. Click here for instructions on how to assemble clean-up buckets. It is important to respond in ways that don’t complicate the work being done. So here are a couple of things to keep in mind. Be sure that the request is legitimate. Scams have already begun to emerge. Be sure that you bring/send only the things that the group requests. It is not unusual in disasters for recovery groups to be inundated with resources from well intentioned folks; unfortunately the groups doing the recovery work don’t have the capacity to manage, store, and distribute the resources and they become an additional burden. So be sure you communicate and coordinate with the recovery group. The same is true for volunteering. The need is tremendous, but be sure you work with a group that can use your skills and efforts and has the capacity to coordinate meals and lodging for volunteers. "You can help by advising interested parties NOT to send clothing/food/etc. at this time. Our churches have been very appreciative of the financial report received from One Great Hour of Sharing but an additional burden is being placed on them by the flood of clothing and other goods which has been coming their way. "Daily we are contacted by individuals and groups from across the country who want to come to the region to help. We do not have the capacity to host groups at this time. "We too join you in expressing our caring and concern for our neighbors in New York and southern Connecticut who are also recovering from Sandy's devastation. "As we head toward Thanksgiving week, we thank you for your caring and willingness to help." Your church may want to take a collection for hurricane relief. Our United Church of Christ has set up a fund for the immediate and long term recovery of all those impacted by Hurricane Sandy from the Caribbean to the midwest. You can find more information here. You can also send your collections to our Massachusetts Conference office and we will gather them and send them along to our national office. Just be sure to mark "Hurricane Sandy Relief" in the memo. Keep an eye on our website and our weekly emailing for ongoing information and updates. The Red Cross has put out an appeal. Many blood drives had to be cancelled due to the storm's impact and that is seriously stretching the supply. If your church can host a blood drive, contact your local chapter of the American Red Cross.